Natalia Osipova is one of the great exponents of classical ballet because of both her fearless technique and her interpretive sensibility. That she is interested in exploring other forms of dance is no surprise, but her choice of choreographers for Pure Dance, a Sadler’s Wells co-production with New York City Centre, doesn’t always work in her favour. In an interview with Sarah Crompton she says, “…I have chosen the choreographers and partners I wanted to work with and through them I express myself.” It is on this question of expression that Pure Dance hinges. A great classical ballet like Giselle or Swan Lake — or a more contemporary masterpiece like John Cranko’s Onegin — requires the faithful expression of its choreography rather than the self expression of its prima ballerina. An interpreter like Osipova can step inside such choreography and express it on an emotional, spiritual and physical level because all these levels exist within it and within her. The irony of Pure Dance is that in a program she has designed to explore new avenues of expression we can’t always find her. The meditative duet from Antony Tudor’s The Leaves are Fading is not an ideal opener; divorced from its choreographic and scenic context it appears out of nowhere, but Tudor’s understanding of classical technique and gesture gives Osipova something to which she can give life. Everything necessary to the work is contained within it and although neither Osipova nor her partner David Hallberg seem entirely at ease at the beginning, their interpretation grows with the notion of memory that Tudor evokes with such refinement to Antonin Dvořák’s chamber string music. There is an autumnal sense in the work that is not only associated with falling leaves but with memories of falling in love; the recurring theme in the choreography is falling away and being swept up and here Osipova and Hallberg express the delicacy and poignancy of the emotion without having to add anything extraneous. The contrast with Iván Pérez’s Flutter, choreographed on Nico Muhly’s Mothertongue, is marked. The manner in which Osipova and partner Jonathan Goddard repeat their opening sequence of capering down stage like two commedia dell’ artefigures from darkness into Nigel Edwards’ light and withdraw again is a metaphor for the emergence and disappearance of expression. There is fine partnering between the two, but Goddard’s technical affinity with the choreography upstages Osipova who is left to emote on its surface in the absence of an appropriate vehicle for her. In Roy Assaf’s Six Years Later Osipova shares the stage with Jason Kittelberger, with whom she appeared two years ago in her first Sadler’s Wells production. This is a more successful balance between the two in what is essentially a choreographed dialogue between two old friends with qualities that recur in much Israeli choreography of tenderness juxtaposed with violence. The dynamics of the relationship are suggested by a progression from Beethoven’s Moonlight Sonata to Marmalade’s Reflections of my life where it is cut off in mid flight with an abrupt blackout. The choreography focuses on what lies between the two rather than on what each brings to the dialogue; six years before might have been more interesting. As soon as Osipova and Hallberg begin to dance Alexei Ratmansky’s Valse Triste there is a welcome sense of connection between performers, choreography and music that lights up the stage. Ratmansky knows the qualities of both dancers and how to bring them out. There is also a Russian connection; as Osipova explains to Crompton, “When the three of us are standing together we feel like close souls.” Here, as in Tudor’s work, all expression is contained within the choreography and both dancers come alive in getting inside it. The program also includes two solos, In Absentia for Hallberg by Kim Brandstrup, and Ave Maria for Osipova by Yuka Oishi. Brandstrup uses Bach’s haunting Chaconne in D minor for solo violin as the basis of a performative rehearsal, as if the music is circulating in Hallberg’s head while he sits listening or gets up to go over the steps he has just learned. It’s an intimate portrait that is given another dimension by Jean Kalman’s lighting. In Oishi’s Ave Maria Franz Schubert’s music, Adam Carrée’s lighting and Stewart J. Charlesworth’s white dress frame Osipova in playful innocence while Oishi’s lightning quick classical steps pay tribute to her devilish technique. Osipova is clearly having fun but it’s a confectionary portrait that starkly underlines the difference between self-expression and expressive choreography. Sergei Polunin has long been interested in mythology. It could be said that his early life up to his departure from the Royal Ballet has elements of the myth of Icarus, and his more recent re-emergence in the light of Take Me To Church with the myth of Narcissus. It is perhaps no coincidence that Project Polunin should bookend its triple bill with works that reference both, though in terms of Polunin’s life there’s an important hiatus between the two. With the recent release of Steven Cantor’s film The Dancer about Polunin’s life, it would be easy to imagine that Project Polunin follows on seamlessly where the film leaves off. But The Dancer took five years to film and another year to edit, so the film’s concluding performance of Take Me To Church — which at the time Polunin conceived as the final act of his ballet career — happened six years ago. A lot has happened in Polunin’s life in the intervening years; most importantly he has rediscovered his desire to dance and has gathered around him a group of creative people who have given him the confidence and stability to develop new projects. He is also, as evidenced in his Q&A following the launch of the film, questioning current norms in the ballet world with the proselytizing zeal of a reformer. Expectations run high for an event like this, especially with the media attention from The Dancer. Will Project Polunin fly or won’t it? When Polunin discovered a video of Vladimir Vasiliev’s duet, Icarus, the night before the flight — created for himself and his wife Ekaterina Maximova in 1971 — it must have struck him as auspicious. Vasiliev had inspired the young Polunin with his powerful, passionate style of dance, and here was choreography with a mythical subject close to his own heart. Polunin extended an invitation to Vasiliev (Maximova died in 2009) to come to London to mount the duet on a younger pair of lovers, Polunin and Natalia Osipova. The choreography for both male and female equates powerful technique with powerful emotions, heroic form with mythological mettle. Polunin revels in the bravura steps, displaying the elevation and flight for which he is renowned and, as his betrothed Aeola, Osipova has so integrated her prodigious technique into her body that she can express every nuance of her devotion to Icarus as well as the depth of her despair suggested in Vasiliev’s choreography. Just to see these two together giving full rein to their Russian heritage is a privilege. After only a brief pause we jump 45 years ahead to Tea or Coffee, served Russian style with dark and surreal humour. Choreographed by Andrey Kaydanovsky for four soloists from the Moscow Stanislavsky Ballet (Alexey Lyubimov, Valeria Mukhanova, Asastasia Pershenkova and Evgeny Poklitar), the ballet could well share the lineage of Nikolai Gogol with last year’s Royal Opera production of Dmitri Shostakovich’s The Nose, except that instead of the nose it is a cup of tea (or coffee) that seems to have a life and influence of its own. The work consists of four rounds of a game in which whoever starts by stirring the cup of tea (or coffee) is initially eliminated from the next one. Within this ludic format the two couples interchange and squabble over an unspecified but evidently banal issue which gives rise to is a delightfully absurd set of convoluted solos, duets, double duets and trios that borrow their wit and rhythm from the eclectic score. The relevance of Narcissus and Echo as a contemporary myth is fully developed in the program by Ilan Eshkeri, where he quips, ‘Narcissus’ reflection in the pool is arguably the first selfie.’ Eshkeri also wrote the score (played live by members of the London Metropolitan Orchestra under the baton of Andy Brown) and his concept for Narcissus and Echo is credited as the starting point of the work. In a Polunin work about the power of the image it is not surprising to find the visual influence of photographer David LaChapelle, who conceived the video Take Me To Church. 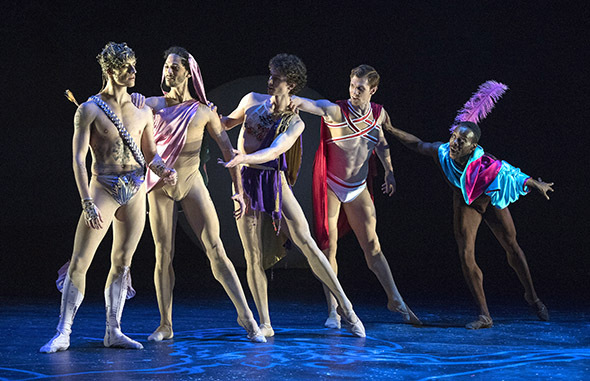 It is evident in the opening tableau of Narcissus (Polunin) and his four Theban mates (Shevelle Dynott, Alexander Nuttall, Daniele Silingardi and Alejandro Virelles), in the overall colour palette and in the surreal pond with its haze of light and outstretched arms appearing from below the dark water. It is less easy to discover the choreographic form of Narcissus and Echo. There are four choreographers listed: Polunin and his assistant choreographer, Valentino Zucchetti, Osipova (for her solo), and Jade Hale-Christofi (also of Take Me To Church fame) for Polunin’s solo. In such a sharing of choreographic initiative it is perhaps inevitable the story of Narcissus and Echo as Eshkeri conceived it is sublimated for a show of dancing inspired by its two protagonists with, in the case of Hale-Christofi’s contribution, ‘selfie’ quotes from Take Me To Church. Polunin, however, inspires his mates to excellence, especially Silingardi and Virelles (both on loan from English National Ballet), while the five nymphs (Alexandra Cameron-Martin, Maria Sascha Khan, Adriana Lizardi, Callie Roberts and Hannah Sofo) seem to operate in the shade of Osipova’s orbit. It is perhaps the first time seeing Osipova working out choreography on her own body, from subtle insinuation to blindingly powerful despair, and the result is sublime. The similarity between The Dancer and Project Polunin is that they are both in the image of Polunin himself; Icarus has recovered but Narcissus is always going to be susceptible. As Eshkeri points out eloquently in his program note, ‘What is fascinating is how quickly the human condition allows us to become intoxicated with ourselves. And once engulfed by it how do we avoid the beguiling fate of our lamentable protagonists.’ Polunin is clearly trying to distance himself from his own image by paying his respects to his past, but he will need to find a new myth to define his next stage of development. There is something soothing about seeing a classical ballet like Giselle. You don’t have to wonder what it’s about, the characters are defined in the narrative, the music and the rhythmic structure are familiar, the sequences haven’t changed and the form is known. What is exciting is the anticipation of a great interpretation, not just of the principal character Giselle but of Albrecht, Hilarion, Berthe and Bathilde, and in the second act the Queen of the Wilis. Apart from these major roles (on whom the clarity of the story depends), there are set pieces for the corps de ballet, most notably in the second act but also in the pas de six in the first. That is not to say the lesser characters — dukes and squires, leaders of the hunt and the villagers in the first act — are less important. There are no small roles; everyone has something to do in a narrative ballet and the success or failure of a performance is made up as much of all these small gestures and actions as it is of the interpretation of the principal dancers. 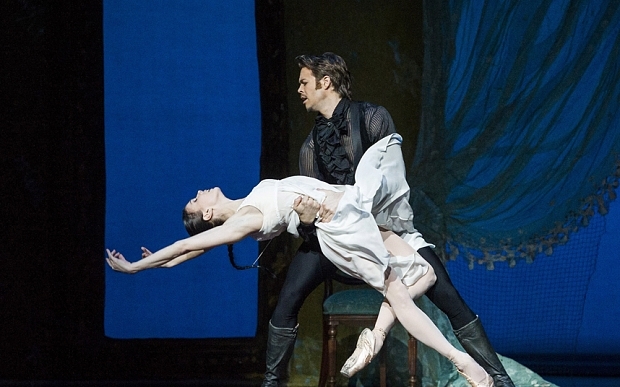 This evening the role of Giselle is danced by Natalia Osipova. I bought a ticket to see her interpretation because she is one of those rare talents with technique and dramatic sensibility who can bring a classical role to a new height of definition. Margot Fonteyn insisted technique is subservient to the ability of a dancer to tell the story. 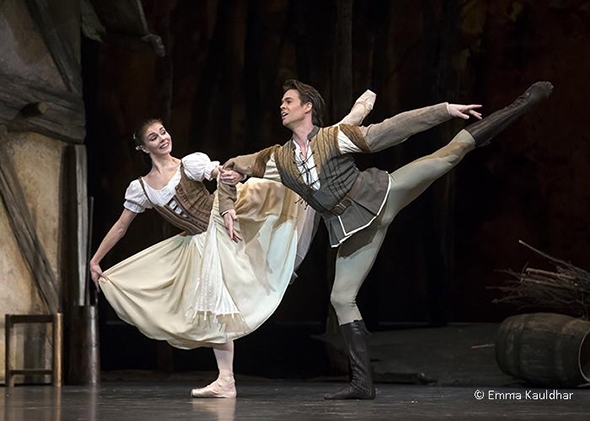 Osipova has both and she does not disappoint; from the moment she steps out of her cottage she is Giselle with all her charm, vitality and naivety expressed in her steps, her posture, gestures, and mime. She is evidently in love and allows that feeling of excitement to infuse her performance. Peter Wright, whose production this is, suggests the possibility that Giselle is of royal birth but illegitimate, a result of the droit de seigneur custom of the time. It would explain why she is different from the other village girls and why her mother wants to protect her from a similar fate to her own. Albrecht is a seigneur himself, son of a noble family that is used to hunting on the lands around the village. He has caught the attention of Giselle and even though he is betrothed to Bathilde, daughter of a local duke, he is drawn to her in spite of himself. This is the delicate balance facing Matthew Golding’s characterisation. Albrecht hasn’t really thought it all through so he has to dissimulate. Golding hasn’t thought it through either and doesn’t. He goes through the noble motions without letting us know what he is thinking or feeling and he fails to differentiate between his feelings for Giselle and those for Bathilde. He talks to them both with the same slow, vapid gestures. This is a major flaw in the production because Osipova has nobody to play off; she appears to fly out of the frame as she did (with the same partner) in Onegin because she is very much on her own; there is only half a conversation. Kristen McNally as Giselle’s mother Berthe is the only character to use her mime to consummate effect; after Giselle’s death the way she brushes Albrecht off her daughter is chilling. Thomas Whitehead as Hilarion also expresses his intentions in mime but, as Wright points out, he is destined to be the baddie and there are few redemptive aspects of his characterisation. Knowing the story, we tend to fill in the colours we don’t see, but it would be heartening to have characters who behave with a full palette and shake us out of our familiarity. It is not only characterisation that is lacking this evening. Though generally of a high standard — this is after all The Royal Ballet — the level of technical excellence can be unexpectedly weak. In the prelude to tragedy in Act 1, the stage is filled with a joyous harvest festival celebration. The traditional peasant pas de deux becomes in Wright’s production a pas de six, an opportunity for junior talents to shine. But the men must have had a hard day in the fields because their dancing is ragged; they can’t land their double tours cleanly which sets off an uncertainty in subsequent steps. Osipova quickly dispels any uneasiness as she takes control of the stage as Giselle becomes unhinged by the shock of Albrecht’s duplicity. Golding could have hidden behind a tree (of which there are many) for all the emotional heft he brings to his unmasking. It is like watching a cinematic version of the ballet in which the camera is focused exclusively on the inner emotions and outer distress of the leading character. As the first act sets up the basis for the second, any emotional weakness in the former will affect the redemptive quality of the latter. Since the cathartic effect of Giselle cannot be fully expressed by one character alone, we are left to watch Osipova from the edges of our seat as she dances on the edge of hers. In such an ethereal setting, the ability to fly is essential and one of Osipova’s qualities is her ability to suspend her shapes in the air, an extension of her musicality. Marianela Nuñez as Queen of the Wilis has an ethereal elegance of line on the ground but, like her band of fellow spirits, appears less free in the air; the flying exit of Wilis is marked more by propulsion than elevation. And while the corps is exquisite in its unity of design and intent, it is a shame that such a ghostly scene — pale moonlit woods in a milky haze — should be interrupted in the moving arabesque section by the earthy reminder of clunky pointe shoes. All these detractions don’t seem to count much. There are endless curtain calls in front of the full house, cheers, applause (for Osipova and Nunez in particular) but I wonder what is being celebrated. Yes, it is a privilege to see Osipova in the role of Giselle, but in this 575th performance by The Royal Ballet one would hope for a more complete experience. The Royal Ballet may make money with its production of Giselle but it is short-changing the audience with this kind of unfulfilled performance. 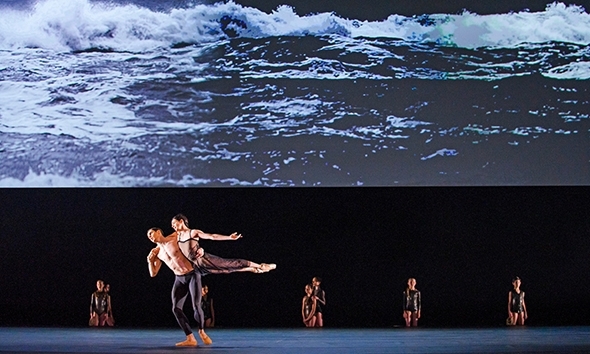 Anyone who knows Wayne McGregor’s work to date would be hard pressed to guess he is the choreographer of the first act of Woolf Works, infused with literary weight and embodied in the lithe, tragic figure of Alessandra Ferri as Virginia Woolf. The act dances like a story; characters enter and leave through giant wooden frames that revolve slowly as they wait to be filled with or emptied of portraits from the past: lovers, her husband, and a soldier killed in the First World War. By her presence alone, it seems, Ferri holds McGregor’s hand and gently traces her movements. Her quality has a stillness that is foreign to the choreographer but he has made this work with her in mind and appears to follow her lead whenever she is on stage. In an interview with Sarah Crompton, Ferri, who returns to the Royal Opera House stage at the age of 52, puts her finger gently but firmly on the phenomenon we are seeing: “You have baggage which a young dancer cannot have because it comes with experience in life and on stage. I feel I am refined to the essential. Companies now, the world over, are very young. When I grew up here in this Company we had dancers like Antoinette Sibley and Merle Park who had a lot of experience. Michael Somes was still here. They had theatrical weight. Now, because the repertory requires these 20-year-old bodies, companies are very young and I think there is a link missing.’ She fills that gap; when she is alone, as she turns in on herself with soft, beguiling spirals, she is at her most expressive. As soon as the men begin to partner her — Federico Bonelli as her young lover or Gary Avis as her husband Leonard — McGregor’s choreography does not maintain those qualities and like a flower that is inexpertly pruned she withdraws from being Woolf to being manipulated. In her sapphic relations with the playful Francesca Hayward and Beatriz Stix-Brunell she is more at ease; women in McGregor’s universe know how to relate to each other. Max Richter’s score is at its most refined in the first act, flowing like memories and ticking like time. The literary nature infects the scenic elements, too, not in its linear narrative but in the painting of inner emotions and thoughts, the stream of consciousness for which Woolf’s output was celebrated. Lucy Carter moulds Ferri and her lovers in an almost palpable emotion of light and haze and Ciguë’s frames change the perspective of now and then with a simplicity that belies — or because of — their scale. However, the panorama of Woolf’s garden at Monk’s House that is projected through the frames onto the backdrop takes us into the realm of an exhibition (for which much of the program resembles the catalogue). Woolf Works is called a triptych because it joins three scenes from three of Woolf’s novels like an altarpiece of her life. The first, I Now, I Then is based on Mrs Dalloway, the second, Becomings, on Orlando and the third, Tuesday, on The Waves. Apart from Watson’s histrionics as a shell-shocked soldier, the fragile sensibility of I Now, I Then gives way to an excuse for McGregor’s standard overextended vocabulary in the time-travelling, shape-shifting central depiction of Becomings. Needless to say Ferri is nowhere to be seen, replaced by a willowy Natalia Osipova who, despite the choreographic desecration of the Woolf altar, makes an extraordinary statement of hyperextended sensuality. Around her is a chaos of couples and brutish couplings (McGregor has not mastered the idea of partnering) racing across a black reflective floor in exotic costumes of the centuries (by Moritz Junge) like figures by Hieronymous Bosch on ecstasy. It looks as if the choreographer has thrown everything he can into Becomings that the presence of Ferri elsewhere would not permit. It is also an occasion for a high-quality light show unleashed by both Carter’s ingenuity and the Opera House’s resources. The function of lighting is traditionally to illuminate the dancers but the level of production here puts lighting on a choreographic level. The final panel, as Ravi Deepres’ slow motion film of waves suggests rather redundantly, is from The Waves. Ferri is the central character again so McGregor is on his best behaviour, or almost. This is the scene where Woolf ends her life (she drowned herself in 1941 by walking into the river Ouse weighted down by stones in her pockets). The panel opens with a reading by Gillian Anderson of Woolf’s final letter to Leonard, a scene that doesn’t immediately suggest Ferri being partnered by a semi-naked Bonelli; it is an interaction that interferes with her lonely, tragic state of mind. There are children who rise on a lift at the back underneath the waves and play games on the shore with rope. They are the children of Woolf’s sister Vanessa Bell (though this is only evident if you read the program) in the form of Sarah Lamb. Ferri sits contemplating, then turns to watch her sister and nieces playing. She gathers her shawl and wanders slowly around the stage while other characters rise on the lift as if arriving on a platform at rush hour to surge on to the stage. McGregor revels in choreographic distraction so it takes concentration to follow Ferri as she keeps her meditative pace around the stage until she arrives in front of the crowd, facing them. Then she is inextricably upended by assorted men and passed between them as if her final parting were a social event. In The Waves she writes about death as ‘active, positive like all the rest, exciting; and of great importance — as an experience. The one experience I shall never describe.’ The choreography fails to take up the challenge. The projected waves gather velocity, the chorus retreats and Bonelli is left to drag Ferri’s dry body to its resting place. When the curtain rises Ferri is alone on stage to receive the applause; it is apt, not only out of respect for the artist she is, but because she is the saviour of Woolf, not only of the Works but of the woman. It is the first time in recent years that I have been gripped by the dance drama on the Royal Opera House stage and it is the interpretation by Natalia Osipova of Tatiana in John Cranko’s Onegin that is responsible. From my seat in the upper amphitheatre, each gesture she makes is clear, however subtle, and when she throws herself at her Onegin — as she does frequently — the effect is like wearing 3D glasses: she flies into the auditorium. I am too far away to see her eyes but I know exactly where they are focused at each moment. Her performance has the naturalness of improvisation — like her plonking down on a bench as she gazes at Onegin in Act 2 to her child-like intensity of stabbing the pen in the inkwell before writing her letter — and the rigour of a beautifully crafted, flawless interpretation of the steps. Perhaps it is Osipova’s Russian soul responding to Pushkin and Tchaikovsky, but Cranko was not a Russian choreographer and the role was created on Marcia Haydée. There is something nevertheless universal in Tatiana. In his biography of Cranko, Theatre in My Blood, John Percival observes that Haydée’s Tatiana was ‘a character who grew through the work and was in every moment entirely convincing as a portrait of an exceptional but credible person.’ He could have been writing about Osipova last Friday night but I can’t help feeling she was able to infuse the role with a spirit that both Pushkin and Tchaikovsky would have recognized. Because Osipova lives the character of Tatiana so fully, her relationship with Onegin requires a heightened sensibility from her partner. Matthew Golding acts his part with less dimensions than Osipova; he appears to remain quite tightly locked into his role — more prince than profligate. He is most at home in the beginning of the first act because he is setting up his character but in the bedroom scene where he is transformed into the dream-like persona Tatiana desires, he cannot leave his aloofness on the far side of the mirror. Osipova is superb here and Golding partners her brilliantly but he never seems to enter into the dream. In the second act Golding fails to colour Cranko’s gestures with a degree of willful petulance that will give Lensky no choice but to challenge him to a duel; we are left wondering what all the fuss is about. And while Tatiana’s stature has risen by the opening of the third act, Onegin’s hasn’t descended which creates an imbalance because the pathos of Act 3 is in the intersection of their divergent paths. At the end Golding runs off and Osipova runs after him, checking herself as she reaches the door. What I didn’t know is that Pushkin never finished his verse novel, and neither does Osipova clarify her emotional state at the end of the ballet. It is left floating in turmoil; however kind and distinguished Count Gremin may be (played with grateful devotion by Bennet Gartside), Tatiana’s heart is more her master than her mind. There are just five principal characters in Onegin who are responsible for the development of the plot. Cranko paints Tatiana’s relationship to her sister Olga (Yasmine Naghdi) with the lightest of touches; the opening scene where the two are introduced in Jürgen Rose’s idyllic country setting reveals a tender competition, with Olga the more effusive of the two; she dances a lovely solo full of joyous bouncing steps surrounded by friends while Tatiana relaxes with feet up on a wicker bench devouring her romantic novel. Olga’s fiancée Lensky (the elegant Matthew Ball) is a finely drawn character, a romantic suitor whose attention is devoted entirely to pleasing Olga. There is no indication of any flaw in his character that will make his jealousy explode so violently in Act 2, nor is there any trait in Olga, apart from her natural ebullience, that suggests her willingness to flirt with Onegin. All this has to be whipped up at the party, and it is left to Cranko’s choreography to make this happen without the full emotional investment by these three characters. These may seem minor details but with an artist of Osipova’s calibre in the cast the standards are set very high. I can’t imagine the ballet Onegin being created to Tchaikovsky’s opera score; what Kurt-Heinz Stolze created with his orchestral arrangements of some of Tchaikovsky’s lesser-known piano compositions and orchestral poems allows the choreography to weave together the characters of Pushkin’s novel seamlessly and leaves the beauty of Cranko’s choreography to match Tchaikovsky’s arias. Sir Frederick Ashton’s Rhapsody, to Rachmaninoff’s Paganini Variations, was created for Mikhail Baryshnikov in 1980. In the program notes Zoë Anderson relates a revealing anecdote about its creation. Baryshnikov was a guest artist of the Royal Ballet that summer and insisted on experiencing the Ashton style in a work created on him. Ashton, on the other hand, saw an opportunity to showcase a virtuoso dancer steeped in the Kirov tradition as a foil to his company. Baryshnikov later admitted to being disappointed: “I wanted English ballet and he wanted Russian ballet.” This evening it is Stephen McRae who takes on Baryshnikov’s role, standing at the centre of a large, sparsely decorated stage as the curtain rises. Clement Crisp’s effusive praise of McRae notwithstanding, his formidable technique is here in the service of somebody else’s distinctive style and steps. Ashton’s genius was to bring out the qualities of the person dancing, and in Baryshnikov he was evidently able to marry expression and technique to a high degree. Trying to recapture that undermines McRae’s ability to express himself in the technique and he is also at a stylistic disadvantage for he is very much English ballet, not Russian ballet. His partner in Rhapsody, Laura Morera, despite her Spanish origins, is very much English ballet, and she fits into Lesley Collier’s original quicksilver shoes and lovely sense of line with consummate ease (Collier was coaching the role). What she doesn’t have is the stylistic contrast in McRae to play against. With these misgivings and the six couples in pastel colours looking a little rough in their patterns and timings (especially the men), Rhapsody forms a rather under-cooked first course to an oddly assorted triple bill. This kind of three-course menu in which a new work is sandwiched between two staples of the repertoire (82 performances each) is predominantly the responsibility of the chef and the chef at The Royal Ballet is not only the director but the one who provides the new work, in this case Wayne (‘dance doesn’t have to be the priority’) McGregor. It is his latest offering, Tetractys – The Art of Fugue, that sits rather uncomfortably between the two classically-based works by his predecessors. McGregor stretches everything but the classical technique, and expressiveness in his dances takes a back seat to his latest intellectual construct. Seeing the work after reading the program notes about Bach’s Art of Fugue (here orchestrated by Michael Berkeley), its signs, symbols, mystical tetractys and association with the Pythagorean theory of numbers, overlaid by set designer Tauba Auerbach’s geometry of glyphs, and you feel heartened by the example of the little boy in Hans Christian Andersen’s tale The Emperor’s New Clothes. The cast is stellar but even stars implode: the feline Natalia Osipova, whose first appearance with Edward Watson is pure sorcery, soon fades into the miasma of over-extended limbs and onerous partnering. Eric Underwood suffers temporary eclipse as he passes through the darker sections of the McGregor/Auerbach dark universe, leaving only the ghostly trace of his phosphorescent unitard, and the luminous qualities of Marianela Nuñez and Lauren Cuthbertson are wholly consumed. McRae, dressed in green but still radiating sparks from Rhapsody, appears out of place and Federico Bonelli is clearly suffering some kind of meltdown (he was unwell enough the following evening for the work to be cancelled, though Osipova’s concussion was an additional factor). McGregor sums up in the program notes the link between Bach’s Art of Fugue (without the definite article) and Tetractys – The Art of Fugue: ‘I am thinking of this piece as a fugue in terms of my own structure: I have the Bach, I have the design, I have my choreography and I have Michael Berkeley’s version of the score. So there are four elements, each with a different logic, but which absolutely speak to each other.’ Speaking has never been a problem for McGregor, but finding a formal framework for his onstage dialogues and an expressive vehicle for his dancers has. It was all the spirits of Ashton and MacMillan could do to pull the evening out of its black hole. Sir Kenneth Macmillan had been contemplating a ballet about the First World War for some time as his father had served in the trenches and like so many survivors had been unable to talk about the horror. The catalyst was a 1979 BBC dramatization of Vera Brittain’s autobiography, Testament of Youth, describing the devastating impact of that war on an entire generation. Commissioned to create a new one-act work for the Royal Ballet in 1980 (the same year as Rhapsody), MacMillan brought his project to fruition, using Francis Poulenc’s Gloria in G Major — a hymn to the glory of God — as a counterbalance to his vision of the devastation of war. He discovered Andy Klunder’s sculptural work ‘accidentally’ at the Slade School of Art and felt immediately a connection to what he wanted to express in Gloria. He asked Klunder to design the set — a stylised battlefield with the dancers appearing out of and disappearing into an unseen trench at the back — and the costumes: a decaying flesh unitard for the men with the familiar Brodie helmet and a fragile silver unitard for the women with wisps of fabric hanging from the waist and ‘close-fitting caps with coiled ear-muffs’ that give them, in Jann Parry’s poignant description, the semblance of ‘wraiths of young women cheated of their wedding day’. This is a work in which all the elements do speak to each other eloquently and the superimposition of ideas and juxtapositions create a powerful formal unity. John B. Read’s lighting maintains the dreamlike timelessness of the set while creating with the dancers deep shadows on the floor that resemble dark craters. The mood alternates between hope and pity in a subtly understated choreography that recalls Wilfred Owen’s line that ‘the Poetry is in the pity’. MacMillan casts four principal characters (Carlos Acosta and Thiago Soares as brothers-in-arms and Sarah Lamb and Meaghan Grace Hinkis as the two aspects — grieving and lighthearted — of their female companions) against a chorus of women and soldiers. After the first section of the Gloria in which the chorus slowly peoples the desolate stage, a lively quartet erupts with Hinkis being tossed freely among three men (on her own feet she dances with edgy abandon, a joy to watch). Acosta enters as if holding a rifle, a tragic figure who displays a powerful sense of weariness and despair; his turns gradually pull him down to the ground to sleep. Lamb and Soares perform the central duet to the Domine Deus sung by soprano Dušica Bijelic whose lovely voice is itself tinged with grief. Lamb is transformed here by the form MacMillan gives to the duet, her gorgeous lines complementing those of Soares in a spare choreography that fills the stage with redemptive pathos. In Domine Fili, the quartet returns with Hingis flying in over the trench followed by a trio of Lamb, Acosta and Soares. MacMillan creates masterly groupings of women like a protective fence or battlements to honour perhaps the lives of nurses like Vera Brittain herself who devoted themselves to the dying and wounded throughout the war. As Bijelic sings Qui sedes ad dexteram Patris, the dancers make their inexorable way back to the trench of their death or mourning, while the trio remains as a vestige of the living. Soares and Lamb finally leave by the same path leaving Acosta circling the stage in a series of gallant leaps before coming to a halt by the trench to listen to the final strains of in gloria dei. On the uplifting Amen he drops suddenly from view to his own death and resurrection in the depths of the earth.